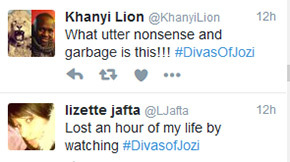 Divas of Jozi: the reviews are in and they're B.A.D. The reviews are in and the people have spoken. LOUDLY. 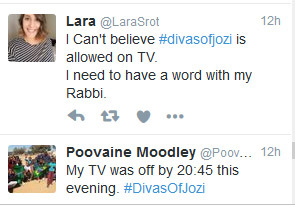 The Real Housewives of Jozi Divas of Jozi premiered on SABC3 on Monday night (4 July) and Twitter erupted with an outcry. 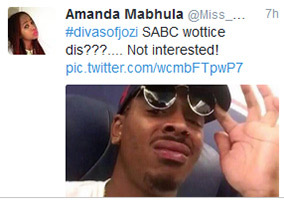 There was such explosive criticism for the show that it needs to be renamed Flops of Jozi. There are many more like this - they go on and on. Don't forget that you can rate shows on TVSA. 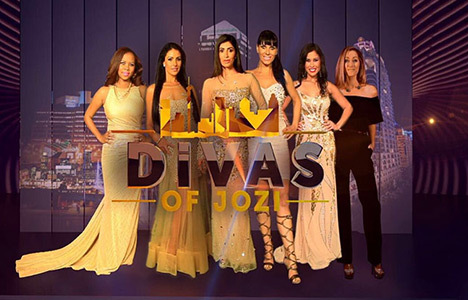 You can give the show a rating out of 10 on its Show Page here: Divas of Jozi. 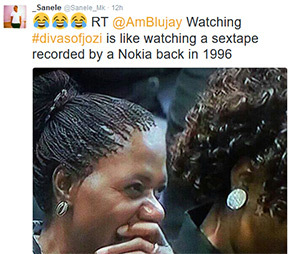 Now that was trash, the visuals, sound quality....very poor. The 2 minutes I watched was enough for me. 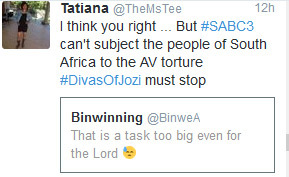 To even think that I lost Survivor for this trash... they must take tips from Mzansi Magic on how to produce quality. Thank God I stopped paying the TV licence 2 years ago. Camera work was sloppy,sound was bad ,there was zero content and scenes drag for too long by I will give it a chance .TVSA please give us a review of The Sober Companion with Trevor Gumbi .the show is well written and the cast is great .I really enjoyed it . Hi Max - we'd love to hear more about what you think about it. You can review it for it's Show Page if you're keen.